Our rich industry experience in this domain helped us to offer a broad range of Office Glass Partition for our reputed clients. With our knowledgeable personnel, we are keenly engaged in presenting a qualitative range of Glass Partition. The products obtainable by us are developed under the supervision of skillful experts. Owing to huge industry expertise, we are offering a wide range of Partition Glass to our patrons. Owing to the vast acquaintance, our firm is competent to present Designer Glass Partition. To meet the diverse requirement of Glass Partition of our esteemed customers. These products are made from high quality raw material. Leveraging on our enormous business competency and huge info of this field, we have brought forth a vast gamut of Aluminium Glass Partition. With rich industry experience & knowledge, we have been able to provide the best array of Office Glass Partition. 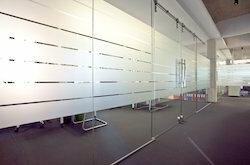 TOUGHENED Glass partitions are a series of single toughened glass panels that are suspended from an aluminum track. These can also slide along the robust aluminum ceiling track. As per the individual requirements and specifications, our movable glass partitions can be used for space division in a flexible and elegant manner. All kind of partition system made at site as per requirement of customer. This normal includes wooden, toughened glass, paint, gypsum, aluminum etc type. 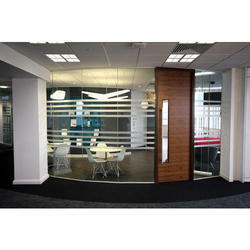 Our firm has made the unbelievable breakthrough in the providing Office Glass Installation Work. Attributed to its flexibility and reliability, these services are broadly demanded. Clients can acquire these services at most affordable rates.